Are you utilizing CRM within your organization? Then this course is made for you! Our CRM Director course is specifically designed for companies who want the maximum return on their investment. Participants will learn how to strategically align their organizations to build profitable customer relationship. This course provides you with the knowledge and tools you need to create long-term strategies that meet business growth and customer lifetime value and CRM implementation objectives. Learn how to interpret data gathered at the Customer Service Center and leverage on the findings. Our Certified Customer Service Analyst class will guide you through the jungle of metrics to enable you to take pro-active action, enabling Customer Service Managers & Professional to deliver the best possible service to your customers. How to do more with saying less? How to manage customer expectation? How to impress the customer with proactive service? How to say "NO"? The Certified Customer Service Professional course will equip the participants with effective customer handling techniques and Best Practices. This course facilitates participants’ systematic measurement of required skills and mindset so that proper development plans can be established accordingly. Participants will learn the basic and advanced topics in Contact Center Management that enable the participants to increase their awareness and knowledge of the latest development of Contact Center in terms of technology as well as management concept. Also, they will learn how to develop appropriate plans to integrate the Contact Center within the organization and bring new insights, set visions and lead Contact Center teams. Whether implementing a new Contact Center or rejuvenating an existing one, participants will be prepared for the challenges. Participants will learn the basic and advanced topics in Service Center Management that enable the participants to increase their awareness and knowledge of the latest development of Service Center in terms of technology as well as management concept. Also, they will learn how to develop appropriate plans to integrate the Service Center within the organization and bring new insights, set visions and lead Service Center teams. Whether implementing a new Service Center or rejuvenating an existing one, participants will be prepared for the challenges. Participants will learn advanced analytical techniques used in the Contact Center, data interpretation and how to take action based on this analysis. Participants will also equip themselves with a comprehensive understanding of auditing techniques used in Contact Center and to ensure Quality Standards are implemented and followed. In addition, participants will have a greater understanding of the need to perform periodic audits and how to measure success. Participants will learn the basic and advanced topics in Contact Center Management that enable them to increase their awareness and knowledge of the latest development of Contact Center in terms of technology as well as management concept. Also, participants will have an effective learning of Contact Center including required skills and mindset to provide the strategic value to customers and the company and to build a successful team to achieve your Contact Center business objectives. Your professionals are at the frontline - these are the people who represent you company's image. Join of Certified Contact Center Professional class and equip them with the best practices for handling customers. We will introduce to them the importance of Standard Operating Procedures (SOP's) and Service Level Agreements (SLA's) as well as the impact they can have on your company's revenue channels. Maximize their skills to ensure 100% satisfaction is accomplished at each and every contact. The course will enable the participants to increase their awareness and knowledge of the latest development of Contact Center Telemarketing in terms of technology as well as management concept. It also addresses the importance of managing the Contact Center Team and exceeding customer expectations by elevating service level, customer care and professionalism at the Contact Center. Participants will have an effective learning of Contact Center including required skills and mindset to provide the strategic value to customers and the company and to build a successful team to achieve your Contact Center telemarketing and sales objectives. Many companies are already transforming their "cost center" to a "pro-active profit center". Join our Effective Communication class and start using the best strategies to cross-sell and up-sell your products and services. Learn how to turn complaints into sales and increase your revenue opportunities. Contact Center is a stressful environment, and suffers from high staff turnover. Companies are constantly investing in training their frontline professionals, only to find that they leave their job after a short period of time. Our Complaint Handling and Stress Management course is designed to help professional overcome cumulative stress and to handle complaints in an effective manner and reduce turnover at the Contact Center. Planning to survey your customer base? Already performing customer satisfaction surveys? STOP!! Join our workshop and learn about satisfaction survey best practices. We'll guide you through the industry's best practices to ensure your results are turned into positive action, increasing your company's bottom line. Want to increase their awareness and knowledge of the latest development of Customer Service in terms of technology as well as management concept? 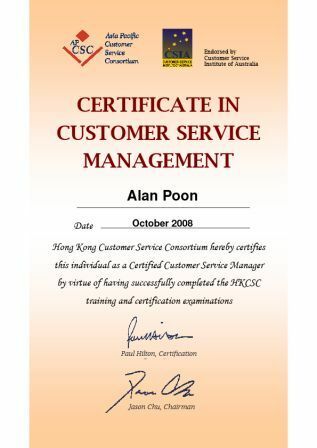 Certificate in Customer Service Management will tell you how to develop appropriate plans to integrate the Customer Service Center within the organization and bring new insights, set visions and lead Customer Service teams. Whether implementing a new Customer Service or rejuvenating an existing one, participants will be prepared for the challenges. It will cover the basic and advanced topics in customer service team leadership that enable the participants to increase their awareness and knowledge of supervisory skills and management concept. Students will also learn how to coach the frontline staff and motivate them. The problem solving skills and service quality efficiency can be enhanced through the training. This course will equip the participants with effective customer handling techniques and Customer Service Best Practices. Participants will learn proactive problem resolution, escalation procedures, and the foundations of Customer Service skills through a four-day complete program.